CHICAGO (January 17, 2018) – Fritz Kaegi, a progressive Democrat running for the Cook County Assessor’s Office, earned the endorsements of Chicago City Council Ald. 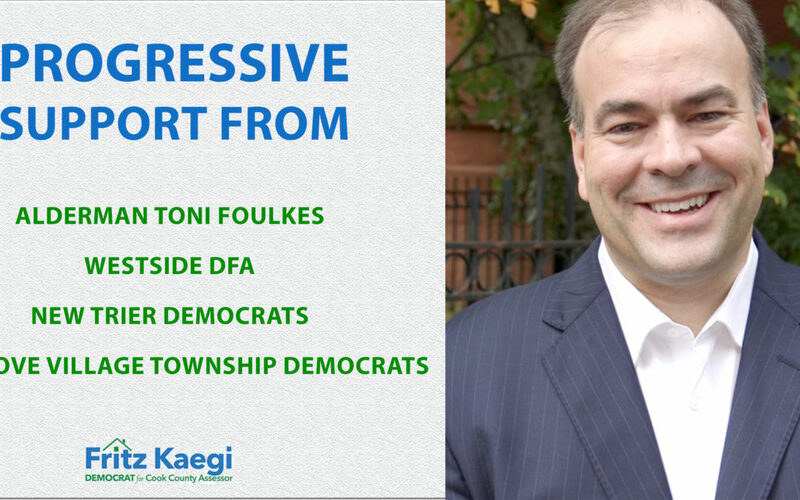 Toni Foulkes (16), the Westside DFA and the Elk Grove Township Democrats on Wednesday, further boosting Kaegi’s county-wide campaign momentum to unseat embattled incumbent Cook County Assessor Joe Berrios. The Westside DFA, a local offshoot of the national Democracy For America political action committee, said, “For too long, minority communities have suffered under a property tax assessment system that caters to the wealthy and well-connected while leaving the working class to take on an unfair property tax burden. Under Assessor Berrios, we have seen unprecedented levels of systemic economic devastation on the west side. It’s time for a change. Additional support for Kaegi, a first-time candidate who has been endorsed by Congressman Danny K. Davis, Congresswoman Robin Kelly, Congressman Bill Foster as well as Cook County Clerk David Orr, Cook County Commissioner Chuy Garcia, and the grassroots progressive group Our Revolution Illinois, among others, comes from the Elk Grove Township Democrats, a community group dedicated to the promotion of democratic principles and candidates for local, Illinois and national politics. In a statement, the group advised, “Our organization endorses Fritz Kaegi’s campaign for the Cook County Assessor’s office. The current property tax system targets working class families in our communities, creating an unfair economic burden that many may never recover from. In related news, on Sunday, the New Trier Democrats also endorsed Kaegi’s campaign during its endorsement meeting. The group is comprised of local activists and volunteers from the New Trier Township area, which includes Wilmette, Kenilworth, Winnetka, Northfield and parts of Glenview.